Paola Fornari Hanna lives in Dhaka, Bangladesh and writes almost daily about its charms and hazards. After reading many of these articles, I have to ask myself . 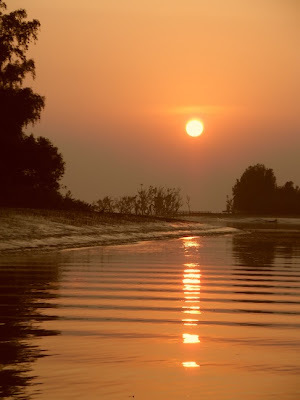 . . why haven't I been to Bangladesh? It's a question not many people ask themselves. Bangladesh has a reputation for abject poverty, catastrophic flooding and violence. Today, I'm getting the inside scoop from a person who is sensitive to and respectful of diverse cultures -- and who thinks Bangladesh is certainly worth a visit. IMBO: Hi, Paola! Welcome again to I Must Be Off! Since you've lived in Dhaka, would you say Bangladesh has lived up to its reputation (poor, dirty, dangerous)? Bangladesh is slightly smaller than England in area, and has a population of 160 million, 15 million of whom are children under five. With 1100 inhabitants per square kilometre, it is the most densely populated country in the world, apart from small city states. And it is prone to natural disasters: As a result of snowmelt in the Himalayas, the massive rivers flood the plains every year. And more devastatingly, from the opposite direction, cyclones sweep north, bringing with them winds of 200 kph, and hammer the coastal belt and beyond. For months at a stretch, two-thirds of the country is under water. It is on the front line for global warming, and the future looks bleak. But what strikes you when you live here is the resilience of the people. They have been dealt a bad hand, but their spirit is strong and they pick up and carry on after every knock. When you next sip tea from your granny's Royal Doulton or Wedgwood porcelain, or don clothes, whether they be H&M or Hugo Boss, bear in mind that they are likely to have been made in Bangladesh. To associate poverty with Bangladesh is to see only part of the full picture. The country is only 40 years old. It is crazy, chaotic and creative. The art scene is unbelievable. There are 80 million mobile phones. Its Nobel Prize-winning Banker of the Poor, Mohammad Yunus, was recently proposed by the Bangladeshi Prime Minister as President of the World Bank. IMBO: If I choose to visit Bangladesh, where should I go to enjoy the best the country has to offer? Annual events worth a visit to Bangladesh? It depends a bit on what sort of traveller you are. Bangladesh is not for you if you're looking for luxury. The weather is hot and humid for most of the year, the traffic is insane, and it is crowded, noisy and polluted. If you are patient and intrepid, a visit to the chaotic, capital Dhaka, would be indispensable, just to experience (and share with me!) the day-long traffic jams. You could head to some of the bazaars downtown and pick up cheap designer clothes. These are not fakes - simply overstocks from the garments factories. 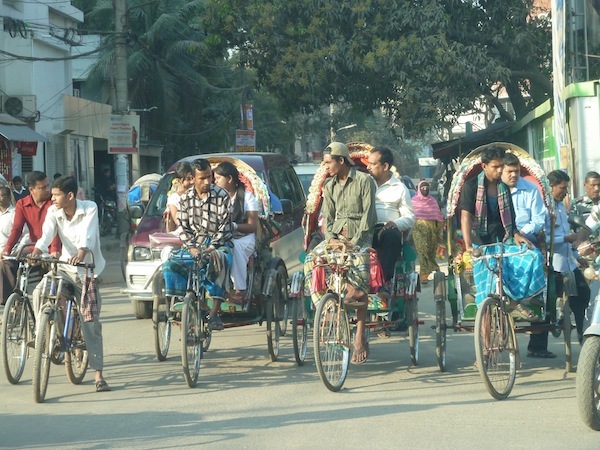 Bangladesh is the world's rickshaw capital, with about half a million of these colourful vehicles - take one and stop at a roadside tea-stall to sip some sweet tea and chew paan - betel leaf. 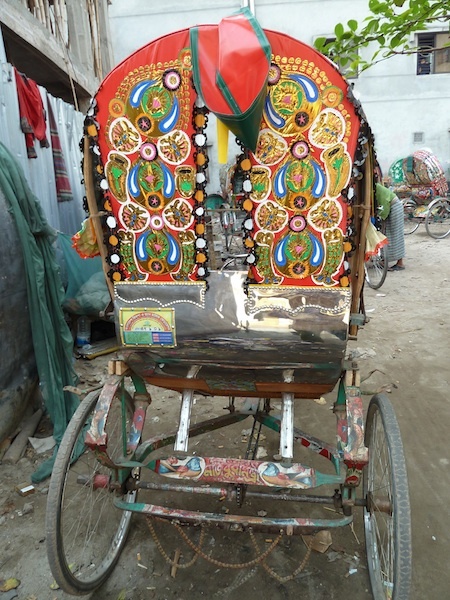 Bangladesh is the world's rickshaw capital. 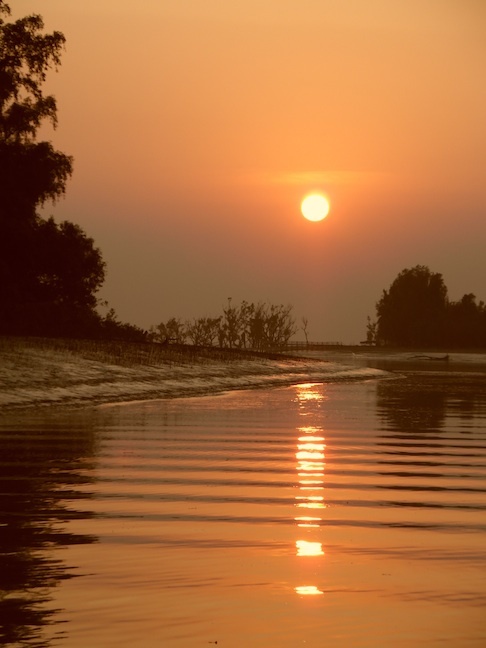 Don't miss the Sundarbans, the UNESCO World Heritage site which is home to the Royal Bengal Tiger: sailing down the innumerable canals of the delta in the south of the country, your Dhaka-traffic-shot nerves will find true peace and tranquillity. I have heard that Srimongol to the north-east, Bangladesh's 'Little Darjeeling' is well worth a visit - great for cycling - I will be going next month. Another place I have not yet visited is the Chittagong Hill Tracts, where 11 different minority tribes live in the hills bordering Myanmar. My guide book stresses that one should avoid intruding into the lives of the tribal people, and says 'ensure you ask permission before entering the villages'. There are tensions in the area following a long conflict lasting from partition in 1947 to the peace treaty in 1997 and beyond. You need a permit to go there, and caution is advised. Festivals: there are a lot of them. Though Bangladesh is predominantly Moslem, it is a secular state. Ramadhan is the most important event in the Moslem calendar. During the month-long fasting period, traffic is even worse than usual, especially in the evenings. It ends with a massive holiday lasting several days - that's a good time to visit Dhaka - but the dates change every year. Festivals from other religions are also celebrated. Almost ten percent of the population is Hindu. The Hindu Durga Puja Festival is a very colourful one. It celebrates the victory of Mother Durga over the demon Mahishasura. Thousands of ten-armed Durga idols are displayed around the country, and at the end of a week's festivities they're all chucked into the river, symbolising Durga's return to the Heavens. Tha Garo Wangala festival is a stunningly vibrant one. There are various minority ethnic groups in Bangladesh, and the Garo, who live near the Meghalaya hills to the north, number about 200,000. Their annual celebration is associated with the harvest, and falls in November or December, depending on the full moon. This is a particularly interesting occasion, as the people are so different from the Bengalis - they are more like people from Myanmar or Nepal. They have a matrineal society, and were converted to Christianity over a hundred years ago. The Bengali New Year, celebrated on 14 April, is again a picturesque time to visit: everyone turns out wearing red and white saris and punjabis. Mother Language Day is one of my favourites. In 1952, the people of what is now Bangladesh took to the streets demanding that Bangla be recognised as the official language of East Pakistan. Police opened fire and four protesters were killed. The discontent which started in 1952 eventually led to the emergence of Bangladesh, which means the country of the Bangla language. Since 2000, UNESCO has been observing International Mother Language Day on 21 February. Here in Bangladesh, people wear black and white in honour of the martyrs who died for their language. A vibrant week-long book fair is held around this time. And to see more photos of the 'real' Bangladesh, go HERE . This is a 'crowdsourced travel photography project' designed to 'accumulate the country’s best travel photography into a single resource library for usage in promoting Bangladesh internationally'. I am happy to say one of of my photos made the final cut of 100 -- I'm waiting to hear whether it will be used in the next Bradt guide! IMBO: Which locations should I avoid? Is travelling in Bangladesh safe? How would you advise a tourist who doesn't speak Bangla to travel? Don't walk or take rickshaws at night in the cities. People say travelling by train is fun, but I haven't yet tried it. Your safest bet is to take internal flights, if you're not on a tight budget. I would avoid buses -- way too dangerous. I've never found (anywhere in the world) where not speaking a language is a barrier to communication, and the friendlier the people, the easier it is to connect. Bangladeshis are particularly friendly. Thank you for allowing me to share my host country with you. If there's one lesson I've learnt from a lifetime of travel - and I think I've said this in a previous interview on this site -- it's that you don't need to be comfortable to have fun! IMBO: Well, this interview was definitely fun. It's been a pleasure -- for me and I'm sure for my readers -- to have you back at I Must Be Off!, Paola. You've brought Bangladesh much closer to me now. Thank you. *All photographs on this page are the property of Paola Fornari Hanna. Please respect the copyright laws. Paola Fornari Hanna is the trailing spouse par excellence. She's been been following her husband around the world for thirty-three years -- before that she was a trailing daughter. She was born in Tanzania — then Tanganyika — where her father was a doctor. Her parents moved house, and often village, twelve times when she was a child. With her husband, she has moved a further twelve times and has covered four continents. At present they're living in Dhaka, Bangladesh. Christopher Allen is the author of Conversations with S. Teri O'Type. 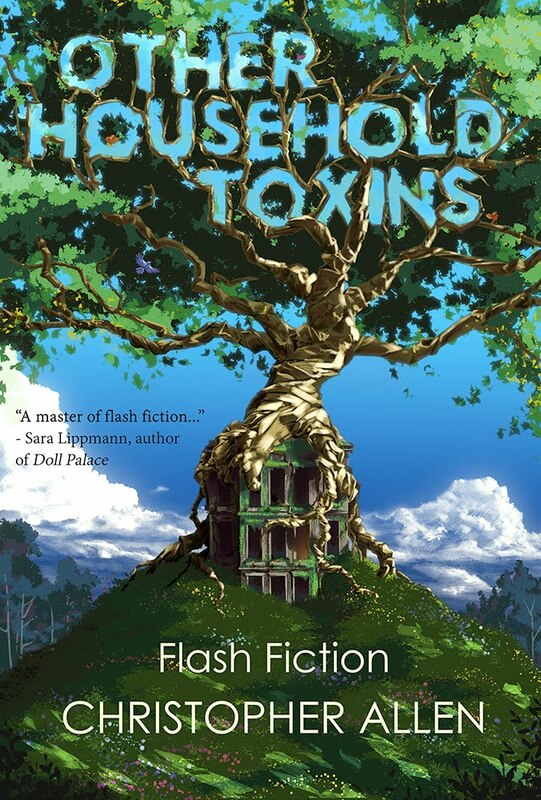 Allen writes fiction, creative non-fiction and of course this here blog. His work has appeared in numerous places both online and in print. Read more about him HERE. You might find it frustrating Paola, but you obviously love the country as well. Beautiful photographs. Well done. 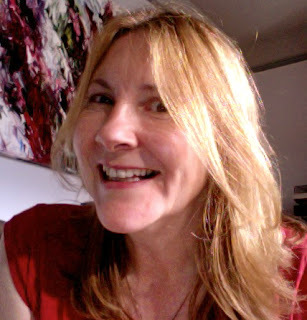 Lovely blog, gave me a sense of being there which I enjoyed. I'm unlikely to go there for real but I visited Bangladesh from my desk! Such a great read Paola & Christopher! Thank you. Not sure I will ever get to Bangladesh, I struggle enough with the traffic in Sydney! Hi Paola & Christopher, This article presented everything in detail is very beautifully. Thanks for sharing with us.